What boundaries define the Sargasso Sea? What is the North Atlantic Garbage Patch? Today’s Wonder of the Day was inspired by Parvati. Parvati Wonders, “Plastic isn't sticky, so what made The Great Pacific Garbage Patch form together?” Thanks for WONDERing with us, Parvati! Are you an expert at geography? Let's test your knowledge with a couple of basic questions. Which large body of water will you find off the east coast of the United States? If you said the Atlantic Ocean, you're correct! If you go several thousand miles the opposite direction, which large body of water will you find off the west coast of the U.S.? If you said the Pacific Ocean, you're right again! We could continue this pattern, asking you to identify bodies of water in relation to their nearest land mass. In fact, we could do this for all the oceans and seas of the world…except one: the Sargasso Sea. All the other oceans and seas around the world are defined, in part, by at least one land boundary. 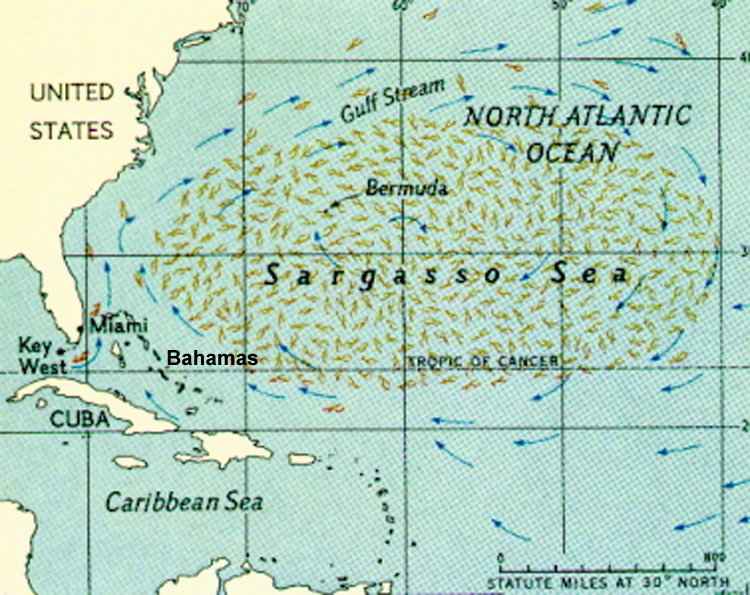 The Sargasso Sea, on the other hand, is a vast area of the North Atlantic Ocean defined by four ocean currents: the Gulf Stream to the west, the North Atlantic Current to the north, the Canary Current to the east, and the North Atlantic Equatorial Current to the south. These currents create an elliptical area called the Northern Atlantic Subtropical Gyre, within which you'll find the Sargasso Sea. Since currents shift based upon many factors, the exact boundaries of the Sargasso Sea fluctuate but tend to correlate with the Azores High Pressure Center. The Sargasso Sea takes its name from Sargassum, a type of brown, free-floating seaweed that thrives in its relatively still waters. Sargassum provides a home for a wide variety of marine species, including sea turtles, shrimp, crabs, eels, sharks, and many types of fish. Home to the Bermuda Islands, the Sargasso Sea was first mentioned by Christopher Columbus, who crossed it on his maiden voyage in 1492. It was also mentioned by author Jules Verne in his famous book, Twenty Thousand Leagues Under the Sea. The calm waters of the Sargasso Sea allow great visibility. In certain areas, you can see as far as 200 feet below the surface. Unfortunately, the stillness of the waters also has a serious downside. The placid waters collect and trap large amounts of trash that are pushed into it by the currents that surround it. In some areas, you can find as much as 200,000 pieces of trash per square kilometer. Scientists have given a name to this huge, floating trash island: the North Atlantic Garbage Patch. They estimate it's hundreds of kilometers in size, but it remains mostly invisible to the naked eye and satellite imagery. That's because so much of the trash consists of tiny pieces of photodegradable plastic that easily get pushed below the surface by waves. Unfortunately, this also makes it hard to clean up without harming small aquatic creatures in the process. Do you have a sweet tooth? If so, tomorrow’s Wonder of the Day is all for you! Want to get a better idea of where the Sargasso Sea is? Jump online to explore this Map of the Sargasso Sea. What would you want to see if you were able to visit the Sargasso Sea? What types of marine life would you be anxious to spot? What does the Sargasso Sea contribute to the world economy? Check out this cool infographic online: The Sargasso Sea: A Vital Ecosystem of Global Importance. Write down three interesting facts you learn from this graphic. To learn more about the North Atlantic Garbage Patch, visit the National Geographic website to read through Huge Garbage Patch Found in Atlantic Too. What types of solutions do you think we need to fix a problem like the huge garbage patches found in oceans around the world? Share your ideas with a friend or family member. The Sargasso Sea is named after Sargassum, a species of what? Which of the following islands is located in the Sargasso Sea? Which of the following is NOT one of the boundaries of the Sargasso Sea? aNorth Atlantic Current Not Quite! cNorth Atlantic Equatorial Current Not Quite!